Connecticut tops the list of states whose taxpayers receive the least bang for their buck from the feds. Ten so-called donor states pay more in taxes to the federal government than they receive back in funding for things like Medicaid or education. Connecticut tops the list of donor states. Residents there receive just 74 cents back for every $1 they pay in federal taxes. 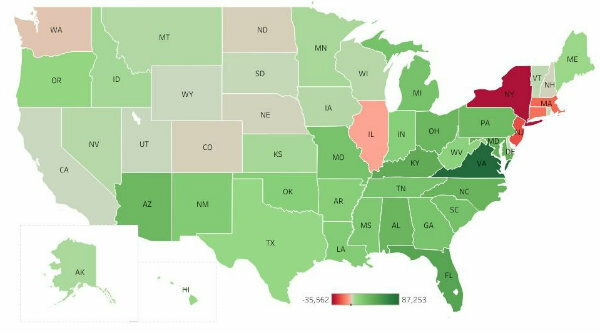 Thanks to 2017's federal tax overhaul, the number of donor states could grow. That's because the amount residents owe in federal taxes will increase now that the state and local tax deduction is capped. Residents in Connecticut, Massachusetts, New Jersey and New York have some of the highest tax bills in the nation. They also pay thousands more in federal taxes than their state receives back in federal funding. In total, 10 states are so-called donor states, meaning they pay more in taxes to the federal government than they receive back in funding for, say, Medicaid or public education. North Dakota, Illinois, New Hampshire, Washington state, Nebraska and Colorado round out the list. Among the top four, the negative balance ranges from $1,792 per capita in New York to a whopping $4,000 in Connecticut, according to anew report by the Rockefeller Institute of Government. Put another way, residents in Connecticut receive just 74 cents back for every $1 they pay in federal taxes. "What the report shows is, when you divide up the receipts, certain states win and certain states lose,” says Michelle Cummings, one of the report’s authors. WHO GIVES AND WHO GETS? Most states get more money back from the federal government than they pay out. But 10 states, shown below in red, give more than they receive. The main reason for the imbalance, particularly in the top four states, is that those places are home to some of the highest household incomes in the country. Therefore, they pay more in federal taxes, which doesn't necessarily equate to more federal money for services. Thanks to 2017's federal tax overhaul, the number of donor states could grow. It's too early to tell by just how much because the most recent data is from the year before the overhaul capped how much in state and local taxes filers could deduct from their federally declared income. But it’s expected that federal taxes for many high-earners -- particularly from the top four states and from California -- could jump, and the gap between what taxpayers in those states pay out and what they receive back from the feds could be even bigger. The study is likely to be used as a political counterpoint to most Republicans' argument that the uncapped state and local tax deduction meant that low-tax states were subsidizing high-tax states. The analysis -- which considered not only direct federal funding for programs but also money for grants, contracts and income earned by federal workers in each state -- is the second study of this kind published by the institute. This year’s report saw some shifts compared with the 2015 one. Notably, high-tax California was no longer on the list of donor states, although just barely -- taxpayers there receive, on average, $12 more from the federal government than they pay out to it. Texas and Minnesota were also bumped off the most recent list. The changes, according to the researchers are mainly due to the shifting around of new contracts and grants in those states. "Taxes are relatively stable, but the federal contracts and expenditures can be a little volatile,” says co-author Laura Schultz. Federal contracting plays a big role in Maryland and Virginia, which both receive much more in contract money than most other states. Virginia receives nearly $2 back for every $1 it sends to Washington, while Maryland receives $1.53. Facing billions in potential liability payments after two seasons of devastating wildfires, the California utility, Pacific Gas & Electric, is reportedly considering bankruptcy. This week, California investigators announced that they are investigating whether PG&E equipment ignited the Camp Fire in 2018, the deadliest blaze in state history. Investigators are also looking into whether the company’s equipment was involved in fires in 2017. PG&E is already being sued by victims of both fires. The investigations could leave the company with legal liabilities topping $30 billion, according to the Los Angeles Times. The announcement prompted S&P Global Ratings to slash the utility’s credit rating to the middle of the junk spectrum. State lawmakers and regulators are looking at options, including allowing the utility to issue bonds to pay its liabilities, bailing it out or breaking it up. As the federal shutdown wraps up its third week, Moody's Investors Services noted that major mass transit systems could start feeling the pinch. That’s because federal grants provide up to 20 percent of operating revenues and a majority of capital funding for some systems. With the shutdown, mass transit systems have temporarily lost financial aid that supports a wide range of needs, from daily maintenance and service to ongoing repair and expansion projects, Moody’s says. Meanwhile, the absence of federal workers commuting to the office is expected to hurt transit ridership and revenue for systems. That’s particularly true for the Washington Metropolitan Area Transit Authority. Federal jobs account for 11.2 percent of the Washington, D.C., region’s total employment, and the region itself accounts for 3 percent of the country’s total economic output, according to Moody’s. Newer PostA State-Run Bank for Marijuana Money? Not So Fast.